At Federici Dental in Manahawkin, NJ, our dentists and staff know how daunting oral surgery can be; but we are here to tell you not to worry! The word “surgery” often brings to mind a hospital stay, general anesthesia, and perhaps a lengthy recovery period. However, the experience of having oral surgery is usually very different from that! Here at Federici Dental, oral surgery is performed at our dental office in Manahawkin while you’re under local anesthesia, ensuring that the entire process is pain free with minimal recovery time. Oral surgery can be utilized to extract impacted wisdom teeth (molars that don't fully protrude through the gums), to place dental implants in the jaw, or for teeth extractions. It can also be used to remedy severe dental problems involving the relationship between the teeth and jaws, including the correction of underbites (the most frequent surgical correction) and congenital abnormalities (birth defects) related to jaw development. Furthermore, oral surgery can even help alleviate sleep apnea, a potentially life-threatening condition. Oral surgery procedures at Federici Dental may be performed to relieve pain, treat an infection or trauma, or to restore function to improve a person's physical appearance. Tooth Extractions - There are a variety of reasons why you may need a tooth or teeth removed. You may have a wisdom tooth that is impacted, a diseased tooth that can't be saved, or overcrowded teeth that need to be removed to create more room to facilitate proper alignment during orthodontics. Dental Implants - Today's preferred method of tooth replacement is a titanium dental implant, which is placed beneath the gum line and into the jawbone during a minor surgical procedure. 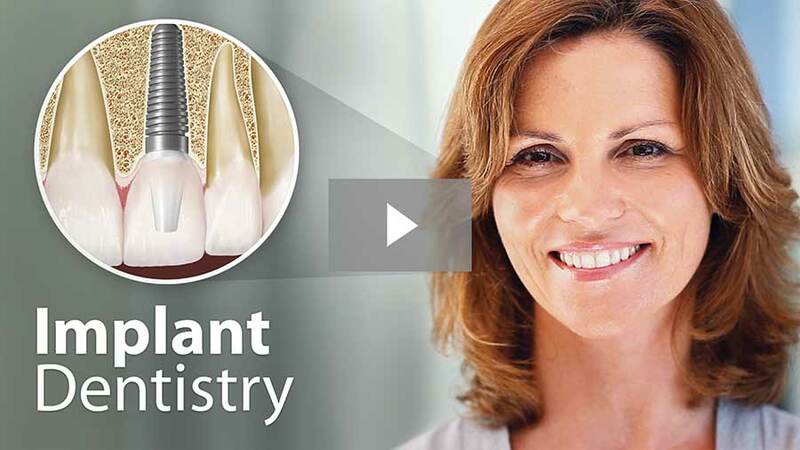 The implant is then attached to a realistic-looking dental crown that is visible above the gum line and indistinguishable from a natural tooth. Reconstructive Surgery. Facial injuries can affect not only a person's ability to carry on basic life functions such as eating but also his or her appearance. Knocked-out teeth can sometimes be re-implanted or replaced with dental implants. Before your oral surgery is performed at Federici Dental, x-rays will often be taken to aid in diagnosis and treatment planning. A step-by-step explanation of the procedure along with your anesthesia options will be discussed. During the procedure planning process, feel free to bring up any questions or concerns you have, as we will be glad to go over any possible alternative measures! Here at Federici Dental, your recovery experience will depend on what procedure you are having, as well as your general state of health. It's always important to let us know what medications you are taking (both prescription and over-the-counter), any chronic health conditions you have, and whether you smoke. This will help ensure your safety and comfort; our dental teams’ utmost concern. At Federici Dental in Manahawkin, our expert dentists and staff believe that you deserve a lifetime with a healthy smile! As the leading dental practice throughout the greater southeastern New Jersey area, we offer comprehensive dental treatments to patients of all ages, providing a comfortable office environment while utilizing state-of-the-art orthodontic technology. Our mission at Federici Dental is to offer you world-class dental treatment in a comfortable atmosphere, including performing corrective oral surgery and teeth extractions! In many cases, problems with your bite or alignment of your teeth can be corrected using today's advanced, non-surgical methods of dental and orthodontic treatment. Sometimes, however, skeletal and dental irregularities aren't so easy to remedy, even with the most up-to-date non-surgical techniques; that's when corrective oral surgery may be recommended. While it may sound like a complex and demanding treatment, oral surgery isn't always so serious! Get In Touch With Federici Dental For Oral Surgery Today! Our main goal at Federici Dental in Manahawkin, NJ, is to make you as comfortable as possible during your oral surgery procedure! With a highly experienced staff and advanced technology for corrective oral surgery, our dental team will ensure you feel right at home during your treatment. Don’t hesitate to contact us today with any questions or concerns you may have about oral surgery. On behalf of our entire team at Federici Dental, we can’t wait to help you get you healthy again!